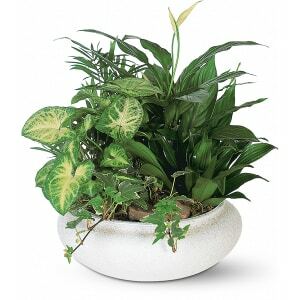 This low bowl is filled with living plants, and will carry comfort and compassion for many months to come. This dish garden is perfect to send to the home or service. • One planter arrives filled with dracaena, ivy, palm, spathiphyllum and syngonium plants. • Appropriate to send directly to the funeral home, or to the family's residence. 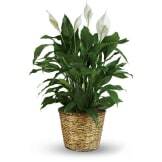 • Arrangement measures approximately 14" W X 15" H.
Flowers will be received by a Bailey Funeral Home's staff. The plants looked ok. There were a few daisies which looked a little cheap to me. There was a butterfly decoration which isn't pictured and which I didn't care for. My main complaint is that the arrangement was not in a dish. It appeared to be in a basket. 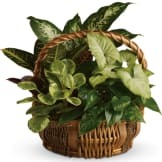 I chose this because I liked the look of the dish and the lush plants pictured. Also there's a $20 extra charge that is not shown until you check out. But they have you as they are affiliated with the funeral home. On the plus side the arrangement was delivered within an hour of ordering. I'm not sure which of the local florists filled this order, but they did a great job. Of course it was different than the photo, but it looked nice. All of our flowers are designed and delivered by hand from a local florist in in Springhill.